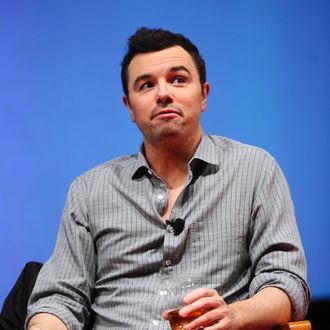 The New Yorker has a profile of Seth MacFarlane this week, and it traces his well-known path from nerdy Rhode Island kid to cheeky Hollywood bajillionaire. It also includes some lesser-known anecdotes, like the time MacFarlane called his mother from the speakerphone in the Family Guy writers’ room and “asked her to tell the story of how, when she was a kid, she masturbated a dog. After she told the story, mother and son laughed uproariously.” Well, now we know where he gets his sense of humor from. That’s only the second strangest tidbit in the article, though. The actual weirdest part is that the story mentions MacFarlane is “meticulously groomed, down to his perfectly uniform arm hairs.” We’re all for attention to detail and appropriate self-care, but meticulous arm hairs? We’re there now?